ww2dbasePrince Heinrich Alexander Ludwig Peter of Sayn-Wittgenstein (German: Heinrich Prinz zu Sayn-Wittgenstein) was born to German diplomat Gustav Alexander Prinz zu Sayn-Wittgenstein and Baroness Walburga von Friesen. He joined the Hitler Youth organization in 1932 and completed secondary education in Germany in 1935. In Apr 1937, he joined the German 17th Cavalry Regiment. In the summer of 1937, he transferred to the German Luftwaffe; in Oct of the same year, he was accepted for flight training, which took place in Braunschweig, Germany. In Jun 1938, he was promoted to the rank of Leutnant. Between late 1938 and early 1939, he served as an observer with the Kampfgeschwader 54 wing as an observer/navigator aboard bombers based at Fritzlar, Germany. He first saw combat during the invasion of France, then also participated in the bombing of targets in the United Kingdom aboard a He 111 bomber with Kampfgeschwader 1. In the winter of 1940 and 1941, he completed courses to earn the Advanced Pilot's Certificate 2, returning to combat duty in Mar 1941. Remaining with Kampfgeschwader 1, he participated in the invasion of the Soviet Union by bombing Soviet airfields at Liepaja, Jelgava, and Riga in Latvia. In Aug 1941, he transferred to the nightfighter force and was made the squadron leader of the 9th Squadron of the Nachtjagdgeschwader 2 wing in Nov 1941, stationed in Western Europe. He scored his first night time kill in May 1942. After achieving 22 victories, he was awarded the Knight's Cross in Oct 1942. He was made the commanding officer of the 4th Group of the Nachtjagdgeschwader 5 wing in Dec 1942. In 1943, his unit was transferred between Western and Eastern Europe several times, and he was equally successful on both fronts. On 15 Aug 1943, he was made the commanding officer of II./Nachtjagdgeschwader 3. After achieving 54 victories, he was awarded Oak Leaves to his Knight's Cross, presented to him by Adolf Hitler at the Wolfsschanze headquarters in East Prussia, Germany on 22 Sep 1943. On 1 Jan 1944, he was named the wing commander of Nachtjagdgeschwader 2; at this time, he had reached 68 victories. On 21 Jan 1944, during a nightfighter mission near Berlin, Germany, after shooting down 5 British bombers, his wings caught fire after being attacked by escorting British fighters. He ordered his crewmen to parachute, who complied with the order, and he attempted to fly the aircraft back to base. Failing to do so, the aircraft crashed in a wooded area in Lübars, Germany, killing him; he might have attempted to bail out of the aircraft, but the parachute did not open. He was posthumously awarded Swords to his Knight's Cross. At the time of his death, Heinrich Prinz zu Sayn-Wittgenstein was the highest scoring German nightfighter ace with 83 kills, 23 of which achieved on the Eastern Front and 60 on the Western Front. He was initially buried at the Deelen airfield in the Netherlands, but his remains moved to Ysselsteyn, the Netherlands in 1948, where he was buried next to fellow aristocratic nightfighter pilot Egmont Prinz zur Lippe-Weißenfeld. 14 Aug 1916 Heinrich Prinz zu Sayn-Wittgenstein was born in Copenhagen, Denmark. 12 Apr 1932 Heinrich Prinz zu Sayn-Wittgenstein joined the Hitler Youth organization in Freiburg im Breisgau, Germany. 15 Jan 1933 Heinrich Prinz zu Sayn-Wittgenstein became a group leader (Kameradschaftsführer) in the Hitler Youth organization. 17 Dec 1935 Heinrich Prinz zu Sayn-Wittgenstein received his Abitur from the Realgymnasium in Freiburg im Breisgau, Germany. 15 Sep 1941 Heinrich Prinz zu Sayn-Wittgenstein was awarded the Ehrenpokal der Luftwaffe goblet. 1 Nov 1941 Heinrich Prinz zu Sayn-Wittgenstein was made the commanding officer of the 9th Squadron in the German Nachtjagdgeschwader 2 wing. 6 May 1942 Heinrich Prinz zu Sayn-Wittgenstein scored his first kill as a nightfighter pilot. 31 Jul 1942 Heinrich Prinz zu Sayn-Wittgenstein shot down three Allied aircraft, increasing his total victories to 17. 21 Aug 1942 Heinrich Prinz zu Sayn-Wittgenstein was awarded the German Cross in Gold. 10 Sep 1942 Heinrich Prinz zu Sayn-Wittgenstein shot down three Allied aircraft, increasing his total victories to 21. 2 Oct 1942 Heinrich Prinz zu Sayn-Wittgenstein was awarded the Knight's Cross of the Iron Cross. 7 Oct 1942 Heinrich Prinz zu Sayn-Wittgenstein was presented the Knight's Cross of the Iron Cross by General Josef Kammhuber. 1 Dec 1942 Heinrich Prinz zu Sayn-Wittgenstein was named the commanding officer of IV./Nachtjagdgeschwader 5. 24 Jun 1943 Heinrich Prinz zu Sayn-Wittgenstein flew the Bf 110 nightfighter for the first time, discovered technical issues, and returned to flying his usual Ju 88 aircraft, in which he shot down four British Lancaster bombers. His victories now stood at 35. 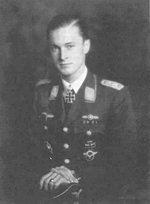 20 Jul 1943 Heinrich Prinz zu Sayn-Wittgenstein shot down seven Soviet aircraft in one single night mission near Oryol, Russia, increasing his victories to 41. 1 Aug 1943 Heinrich Prinz zu Sayn-Wittgenstein shot down three Soviet aircraft, increasing his victories to 46. 3 Aug 1943 Heinrich Prinz zu Sayn-Wittgenstein shot down three Soviet aircraft, increasing his victories to 50. 15 Aug 1943 Heinrich Prinz zu Sayn-Wittgenstein was named the commanding officer of the 2nd Group of Nachtjagdgeschwader 3. 31 Aug 1943 Heinrich Prinz zu Sayn-Wittgenstein was awarded Oak Leaves to his Knight's Cross. 22 Sep 1943 Heinrich Prinz zu Sayn-Wittgenstein was presented Oak Leaves to his Knight's Cross by Adolf Hitler at Wolfsschanze near Rastenburg, East Prussia, Germany. 1 Dec 1943 Heinrich Prinz zu Sayn-Wittgenstein was named the commanding officer of the 2nd Group of Nachtjagdgeschwader 2. 1 Jan 1944 Heinrich Prinz zu Sayn-Wittgenstein was named the commanding officer of Nachtjagdgeschwader 2. 20 Jan 1944 Heinrich Prinz zu Sayn-Wittgenstein shot down three British aircraft near Berlin, Germany, increasing his victories to 78. His Ju 88 aircraft was damaged by the propeller of the third aircraft he shot down, a Lancaster bomber, and only barely made it back to the airfield and had to crash land. 21 Jan 1944 Heinrich Prinz zu Sayn-Wittgenstein shot down 5 British bombers before he was shot down by British escorting fighters. He was killed as the Ju 88 aircraft crashed in a wooded area in Lübars, Germany. 23 Jan 1944 Heinrich Prinz zu Sayn-Wittgenstein was awarded Swords to his Knight's Cross medal posthumously. 25 Jan 1944 The Wehrmachtbericht bulletin issued on this date by the Wehrmacht headquarters announced the death of nightfighter pilot Heinrich Prinz zu Sayn-Wittgenstein. 29 Jan 1944 Heinrich Prinz zu Sayn-Wittgenstein was buried at the cemetery at Deelen airfield in the Netherlands. Thanks for the quick reply.It clears up a long term mystery for me as I had read the book when in my teens and found it facinating about the night fighters but the memory not as good as it was.Also I believe these particular pilots were honourable men in dishourable regime.